For over 165 years, Steinway & Sons has been dedicated to making the finest pianos in the world. Steinway’s pioneering handcrafted methods are still employed today to ensure their uncompromising standards of quality, in turn ensure that the Steinway piano remains the peerless instrument of uncompromising expression. Since 1961, Steinway has chosen Schmitt Music to be its exclusive dealer for Steinway & Sons pianos, and Steinway-designed Boston and Essex pianos. 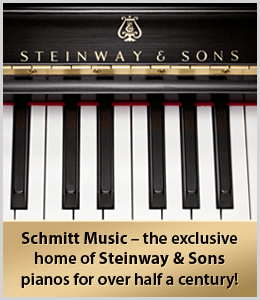 Schmitt Music is proud to be the Fargo area’s only official Steinway piano store – for over 50 years! Visit our piano showroom at Schmitt Music Fargo and you’ll find North Dakota’s best selection of new, vintage & rebuilt, and previously owned Steinway pianos anywhere. Stop in to our piano store in Village West Shopping Center at 4101 13th Ave SW in Fargo, ND, or contact one of Schmitt Music Fargo’s Piano Specialists to schedule your Steinway piano showing today. Since 1853, Steinway pianos have set an uncompromising standard for sound, touch, beauty, and investment value. Steinway remains the choice of 97% of concert artists, and it is the preferred piano of countless musicians, professional and amateur, throughout the world. Watch the video below, as Ron Losby, President – Americas, Steinway & Sons, covers some of the patented features that make a Steinway the world’s finest piano. Contact an Fargo Piano Specialist to schedule your showing, or visit us today at your Fargo piano store, Schmitt Music Fargo! If you’re looking for a new piano for sale, or used pianos for sale in the Fargo area, you need to visit the experts at Schmitt Music Fargo. Have you been searching for a Steinway baby grand piano, or a Steinway & Sons grand piano for sale? You’ll find the best selection in North Dakota at Schmitt Music Fargo, in our piano showrooms. Steinway & Sons grand pianos, upright pianos, plus limited edition and special collection pianos also available. Contact us today!